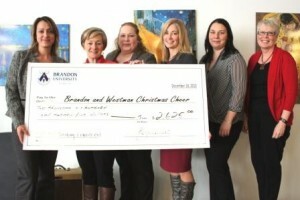 BRANDON, MB – Staff at Brandon University has donated the proceeds from a novel raffle of gift baskets to the Brandon and Westman Christmas Cheer Office. Twenty baskets with unique themes including Redneck Christmas, 50 Shades to Get You Through the Season, It’s All About the Children and the Hey Girl Spa Package were put together by BU employees from every one of the University’s faculties and raffled this past week at the University’s annual Holiday Luncheon for staff, faculty and students. A cheque for $2,625.00 was presented to the local Christmas Cheer Office by the Holiday Luncheon Committee. Organizers say the basket raffle could become a permanent part of the campus calendar. Since 1955, the Brandon and Area Christmas Cheer Board has been providing Christmas dinner and gifts for the children and families in the Westman area who would otherwise go without. To donate, please visit http://www.brandonwestmanchristmascheer.ca/donations.